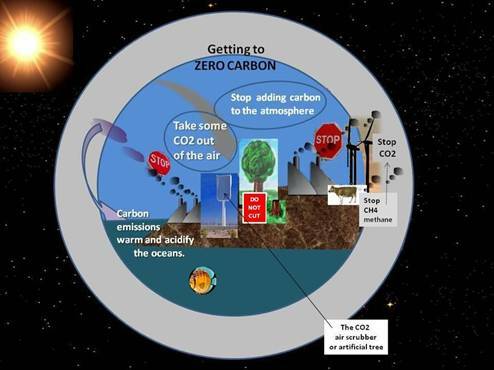 Zero Carbon is the one and only solution there is to global warming, climate disruption and ocean acidification. That’s a fact. Cutting Carbon Emissions – what happens. Carbon emissions have to be cut to virtual zero to stop atmospheric carbon dioxide levels from continuing to rise. Even 1000 years after zero carbon measures are taken the global temperature is still increasing (slowly) and there is no sign of sea level rise slowing. Ocean acidification continues for as long as atmospheric CO2 level is elevated- many thousands of years. Life on Earth cannot survive the devastation of rapidly accelerating global warming, climate disruption and ocean acidification lasting over a thousand years – unless carbon emissions are stopped & starting now. The December 2009 the United Nations Copenhagen Climate Conference resulted in worse than nothing. It formalized the international suicide pact. The ‘Copenhagen Accord’ rejected all proposals, stuck to the 2.C insanity and seeks to delay any measures to cut emissions till 2015 – after the next IPCC assessment. The industrialized nations having failed to implement their obligations under the 1992 UNFCCC (climate convention) have now rejected their obligations under the clear terms of the convention. The Accord amounts to a death sentence for billions of people and invites planetary catastrophe. The science is 100% definite that global climate change and ocean acidification cannot be stopped without stopping carbon emissions. The latest research on global climate change and ocean acidification shows that total planetary catastrophe is inevitable without a planetary zero carbon emergency response. The response of the international scientific and environmental community is in effect no response. No organization submitted to the UN negotiations that the world is in state of emergency or even that the world is in a dangerous climate change situation. All the organizations accepted the suicidal political global warming target of 2 degrees C. The bottom line recommendations of all the organizations is only a 50% reduction of greenhouse emissions (from the 1990 level) and delayed to 2050. In fact incredibly the joint science academies statement to the May 2009 G8+5 conference only recommended a 50% cut on 1990 emissions by 2050. This is already the worst crime against humanity ever. Already 300,000 people are already being killed by global climate change. Aiming for 2C and nowhere near zero carbon emissions no time soon with methane being emitted from the rapidly warming Arctic is a death sentence for Humanity and life on Earth. The climate system science demands that to stop the global temperature and the ocean acidification rising and to reduce the present catastrophically dangerous atmospheric CO2 concentrations we must stop the addition of more carbon to the atmosphere. This entails four things to stop. Reducing is no good enough if it doesn’t lead to stopping. -Stop the burning of fossil fuels. -Convert livestock land to carbon retaining land. -Stop carbon feedback emissions from the warming planet. Though few scientists are saying so in public, the science is 100% definite. Only if we stop putting more carbon into the atmosphere can the increase in the global temperature and ocean acidification, from increasing atmospheric carbon levels, stop. Global carbon emissions must be reduced to zero. Zero carbon emissions means exactly that. Anything less than zero carbon emissions and humanity will not survive because global warming climate disruption and ocean acidification will never stop. 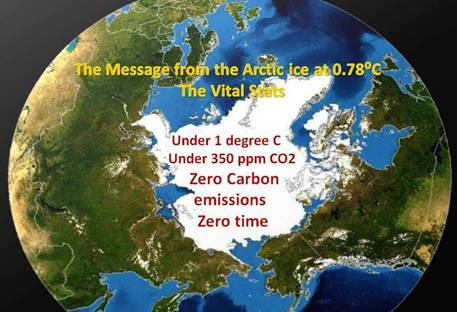 Absolute zero carbon emissions of course cannot be achieved. Virtual zero is what we can and must get down to. The published science consequently agrees that the world must in addition to stopping the combustion of fossil fuels extract carbon direct from the air, that the scientists call ‘negative emissions’ or ‘artificial carbon sinks’. 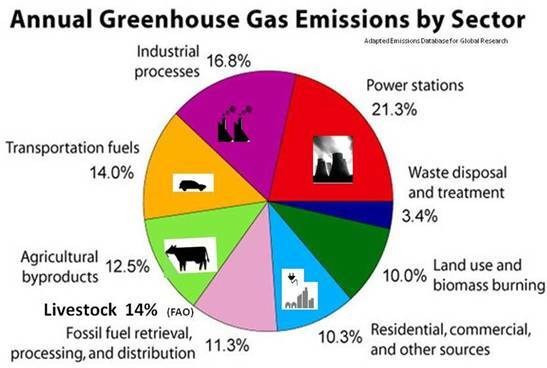 But there is still one very big source of carbon emissions and atmospheric carbon missing. The one missing ingredient is actually the easiest and fastest measure there is. The elephant in the climate change room is our food. Our food is based on chemical intensive meat dominated industrial agriculture and it is right up there with the other two industrial sources of greenhouse gas emissions that as we all know are fossil fueled industries and transportation. There is yet another huge source of carbon emissions and this one is being totally ignored in the decision and policy making. Unfortunately warming up the planet fast cannot be corrected by the Earth systems. Quite the opposite happens – the warming planet emits carbon from the huge stores of carbon that up to now had been safe. The terrestrial stores of carbon on land have been safely balanced by the natural carbon cycle. The largest of all carbon stores have been safely deep frozen in the Arctic. The planet has been warmed by 0.78C. This is enough extra heat to have started the worst form of carbon emission – methane. Methane is being emitted from warming northern peat lands, permafrost on land further north and from subsea coastal methane hydrates. This reinforces the emergency and the need to stop the global warming carbon emissions. It also means we must develop on an emergency. While all involved in global climate change are playing a deadly numbers game, all the global climate change science we have to know are just these few numbers. All the climate change policy to know is one number- zero. What ever the target may be to stop global warming, there is only one way to get to it and that is by zero carbon emissions. It’s that simple and that certain. 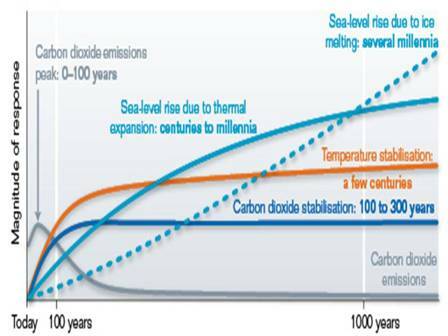 The worst case scenario of the Intergovernmental Panel on Climate Change’s assessment they call A1F1 (the orange graph). We have been above this worst case scenario by global carbon emissions since 2007. 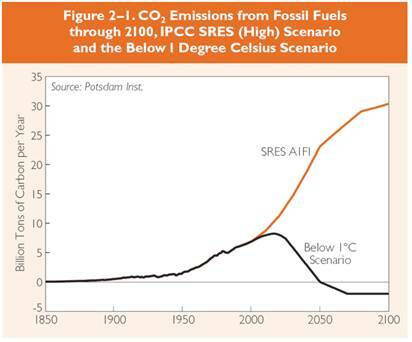 The black graph shows the only way to leave future generations with a chance to get below 1C. 1C is the safe limit that has been recommended by Bill Hare of the Potsdam Climate Institute. In fact 1C was the very first limit proposed back in 1987. There is no possibility whatsoever of getting below 1C (or even 2C for that matter) without zero carbon emissions. But now the planet is telling us we must aim to get back to 0.5C because today’s warming of 0.78C is catastrophic. The rapid (unpredicted) meltdown of the summertime ice covering the Arctic Ocean at 0.78C of global warming has changed everything because this 5000 square mile area of ice stabilizes the climate of the entire northern hemisphere and helps cool the whole planet. This makes today’s 0.78C catastrophic for certain because additional methane is being emitted from across the warmed Arctic by carbon feedback to this degree of global warming. The methane is being emitted by both thawing permafrost on land and melting frozen solid methane (hydrates) under the ocean. This means that the long dreaded runaway global heating is imminent. The more the Arctic is warmed the more methane will be emitted and the faster the planet will be warmed. The loss of the cooling Arctic Ocean ice will accelerate these feedback emissions to a huge degree. The loss of the summertime cooling effect of the Arctic ice will have a sudden impact on water and food security to the entire northern hemisphere because of additional warming and drying. To top it all it is definite because today’s concentration of greenhouse gases will definitely result in a global warming of over double today’s warming. That is a fact of the climate change science. All the ice on the planet is melting away at today’s global warming average temperature of 0.78C. That means that today we are in a catastrophically dangerous situation because today’s global warming will double over the next few decades. The melting of the Arctic Ocean ice will speed up the thawing of the permafrost and the Arctic region will add more methane and carbon dioxide emissions to the atmosphere as a result. 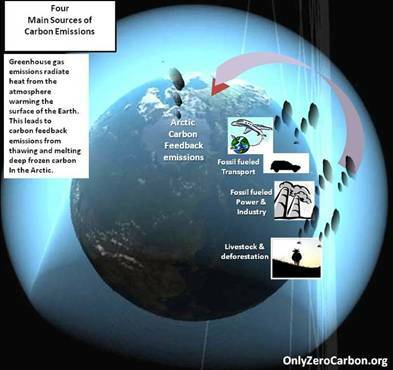 Arctic methane carbon feedback emissions is a planetary catastrophe for certain. However – no climate change organizations are saying so. 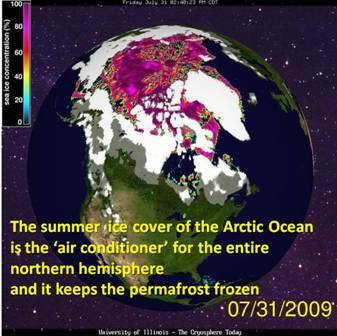 As James Hansen has said we have to get the Arctic to refreeze year round. That means zero carbon with CO2 extraction and now it also means cooling the planet. The climate change scientists and organizations are rejecting CO2 extraction and global cooling out of hand, as if we hadn’t geo-engineered the biosphere to death. The imminent human catastrophe of global climate change is no longer limited to the survival of huge populations living in the most climate change vulnerable regions of the world such as Africa. The rapid melting of the Arctic ice puts is all in peril. We must all push together for zero carbon.